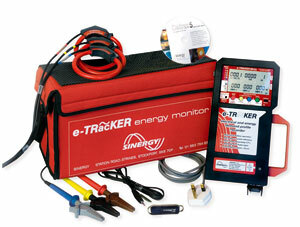 The e-Tracker is a portable kWh meter, allowing you to monitor the incoming power supply to show the pattern of demand over an hour, day, week or month. e-Tracker’s portability gives the flexibility to use it for measuring circuits and specific equipment without the need to have a fixed sub-metering solution. e-Tracker’s practicality extends down to individual loads enabling trials to be done on manufacturing control parameters such as temperature, pressure, speed or material specification and if product quality is to be maintained then the reduced kWh usage can influence whether this manufacturing trial should be adopted permanently. The e-Tracker also displays average and peak demand to enable the calculation of load factor, and through measurement it creates a pattern of usage. This information helps to determine any causes of demand excursions and potential unauthorised consumption. Phase current imbalance affects energy costs by increasing temperature losses on neutral or phase cables and distribution transformers. Poor power factor causes higher currents to flow for the equivalent plant energy conversion compared with unity power factor. e-Tracker will help determine if distribution wiring needs to be re-routed or whether departmental or machine level power factor correction would be cost effective. The cost of expanding production or occupancy can be drastically reduced if e-Tracker proves that the capacity of an existing distribution transformer and cables are accurate. Capacity to store 16,000 lines of all parameters, either on one file or as an aggregate total on up to five separate recording files. Recording will stop when the memory is full.